Co. Galway: Abbycoruncran, Ahascragh, Aughrim (2), Ballinasloe (3), Ballynakill (2), Ballymacward (2), Clonfert (2), Cloontooskert, Eyrecourt (2), Kilconnell, Kilgerril, Killaan, Killasolan (2), Killeronan (2), Killian (2), Killimer (3), Kilquain, Kiltormer, Moylough (2), . Co. Roscommon: Creagh (2), Moore, Tagmaconnell. The Board also included 12 ex-officio Guardians, making a total of 48. The Guardians met each week at noon on Saturday. The population falling within the Union at the 1831 census had been 97,581 with divisions ranging in size from Tagmaconnell (population 1,714) to Killeronan (8,027) and Ballinasloe itself (7,123). The new Ballinasloe Union workhouse was erected in 1840-1 on a six-acre site at the west of Ballinasloe. Designed by the Poor Law Commissioners' architect George Wilkinson, the building was based on one of his standard plans to accommodate 1,000 inmates. Its construction cost £7,600 plus £1,882 for fittings etc. The workhouse was declared fit for the reception of paupers on 20th December 1841, and received its first admissions on 1st January 1842. The location and layout of the workhouse are shown on the 1915 map below. The buildings broadly followed Wilkinson's typical layout although appears to have lacked the usual entrance and administrative block which typically would have stood facing the road at the south of the site. Presumably, the Guardians' board room, the porter's room, waiting room and so on, were located elsewhere in the buildings. The main accommodation block probably had the Master's quarters at the centre, with male and female wings to each side. At the rear, a range of single-storey utility rooms such as bakehouse and washhouse connected through to the infirmary and idiots' wards via a central spine containing the chapel and dining-hall. On several occasions during 1843, up to 100 police were were employed in enforcing the collection of rates at places within the union. In one instance, on 24th November in Ballinasloe itself, 12 military personnel were used for this purpose. During the famine in the mid-1840s, a 64-bed fever hospital was erected at the north-east of the workhouse with the idiot wards converted to use as convalescent accommodation. However, the overcrowding, lack of food and disease took a heavy toll — at the end of 1846, 254 inmates and all the workhouse officers perished. In 1852, the northern part of the Ballinasloe Union went to become part of the new Mountbellew Union. Nursing provision at the workhouse was later taken over the Sisters of Mercy. At a meeting of the Ballinasloe Guardians in January 1885, it was reported that the master of tho workhouse had locked himself up in his bedroom, and refused to produce his books before the board. A committee of the guardians then proceeded to tho master's bedroom, but the master made no response to the knocking at the door. Fearing that he had committed suicide, the police were sent for, but in the meantime the master announced that he was alive and well. He, however, would not open the door, and refused to answer questions from the guardians assembled outside. One of the guardians declared that the master was put to bed that morning at seven o'clock drunk, and it was a serious thing to leave him alone in such a condition. He thought the bedroom door should be broken open, for humanity's sake at least. It was finally arranged to leave the master in the care of his brother. The board, however, suspended him from all his duties, and decided to apply for a Government inquiry into the matter. The matron and schoolmaster were deputed to take charge in the meantime. On 8 October 1918, the male side of the workhouse was taken over by the British Army and the inmates were transferred to Loughrea. After the British withdrawal in January 1922, the Irish National (or 'Free State') Army moved in and occupied the building until after the Civil War in about 1924. 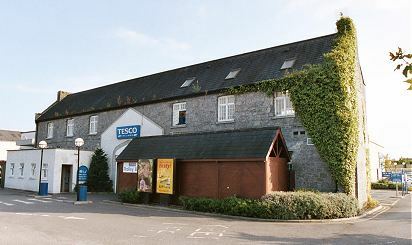 The building was then put to a variety of uses including the housing of the Ballinasloe Branch of the Galway County Library, practice rooms for the Ballinasloe Brass Band and for a number of local sporting and cultural organisations. It also served as a dance hall, secondary school, and was the barracks of the Local Defence Force (later FCA) — the Irish 'home guard'. From 1937, the infirmary section housed the Dubarry shoe factory. Dubarry remained here until the mid-1990s. In around 1955 most of the main building was destroyed by fire and only the East wing remained. Part of the building was used as a lamb slaughter house until the 1970s. In the 1980s, the property was bought by Barretts hardware store. Barretts decided to demolish the remainder of the building in 1995. 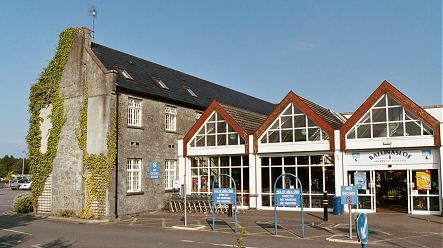 Only the main block of the workhouse fever hospital now survives as part of a supermarket. Ballinasloe former fever hospital from the north-west, 2003. Ballinasloe former fever hospital from the south-west, 2003. Galway local archives, Island House, Cathedral Square, Galway. Holdings include Board of Guardians' minutes (1913-21). Many thanks to Damian Mac Con Uladh for post-1918 information on the workhouse.